The possible rollout delay for New FamilySearch (NFS) that I reported last time has materialized into a major shutdown of the rollout. The new FamilySearch has been implemented in several temple districts. At this point, there are a few issues that need to be resolved before adding more temple districts onto the system. As a result, the implementation date for your temple district has been postponed. You will be notified as soon as a new implementation date is determined. While no reason has been announced, one rumor has it that the problem lies not with the website portion of NFS but with the software that runs inside each temple. However, there have been no reports of temples already active with NFS needing to take precautionary actions or supplemental procedure. Others speculate that the 700 server NFS system in Ashburn, Virginia has already hit its limits and needs to be expanded before additional users are added. Several users have complained that performance of the website has gradually declined until using the system has become painful. It is entirely possible that various anomalies seen in several districts earlier this month can be attributed to the rollout freeze. Consultants in Colorado found they can get on NFS, despite not receiving any announcement. The rollout of the Washington, D.C. temple was announced to the staff, but not members of the district. The Hague, Amsterdam received the rollout DVD media, but nothing else. Coincident with the freeze, the expected release of NFS version 0.92 did not happen on 15-February. Perhaps the release was always planned for the end of the month. Or perhaps the two delays are connected. Regardless of the reason for the delay, it is expected to last for at least four weeks. Stay tuned. I've been keeping the tables in my article, Temple Districts Using New FamilySearch updated. You can usually check there anytime for what is currently known about the release schedule. But after 2 weeks, as you can see I've finally updated my rollout map. Since my last map update NFS has been deployed in 8 temple districts! Both Arizona temples, the Oakland temple (which leaves just 2 California temples), Boston and Detroit temples, the 2 Hawaii temples and Asunción Paraguay. I've added lots of European temples to the table of districts in transition: Frankfurt, Freiberg, Helsinki, London, Stockholm and Swiss. Stateside I've added Chicago. I don't know the official announcement dates for most of these. Do you? How long were they told the transition would take? Are they still being told 4 months? I've added a release date for Dallas, and approximate dates for the Australia temples. I've not heard any more about Washington, D.C. and Denver. Has anyone in those districts been informed that they are being transitioned? Do you remember the Great Announcement of 8-November-2007? Nearly 2 dozen temple districts were announced nearly simultaneously. (See this post followed by this one.) Since that time, FamilySearch has been working their way through these districts. At this point, only a few remain. Las Vegas and Redlands California are scheduled for next Tuesday, the Australian temples for March and Dallas for 11-March-2008. That leaves Bismarck. Has anyone heard when Bismarck will be going live? 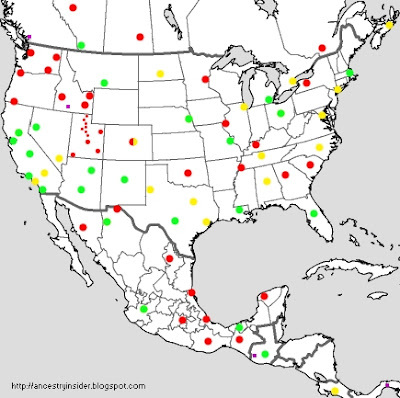 Other districts I think will be going live soon are Buenos Aires, Costa Rica, Houston and maybe Newport Beach. Rollout to all temple districts is expected by the end of 2008. The Wasatch Front will be last. One of the most looked for features in NFS 0.92 is on the Summary view. When a data field has a drop-down menu arrow you can select the data that you believe is most correct without adding a redundant opinion. FamilySearch Labs would like to get feedback from the general public on their new Family Tree design. Previously, only those with New FamilySearch accounts could use and provide feedback on Family Tree. See Dan Lawyer's post for more information. The latest test of the FamilySearch Wiki is up. It can be accessed at https://wiki.familysearch.org. This version uses MediaWiki which was developed for Wikipedia. As more and more Family History Consultants along the Wasatch Front are able to get New FamilySearch accounts, FamilySearch has provided the ability to print ordinance cards. Take your FOR to the Salt Lake Family History Library. Google announced today that Salt Lake City along with 8 other areas has been added to Google Map's Street View, which displays street level photographs of supported cities. 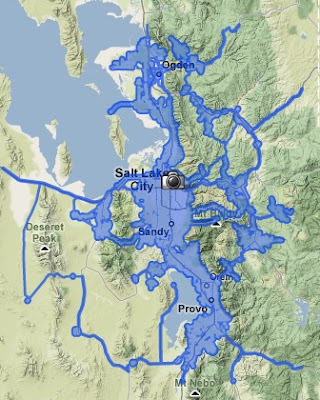 While Salt Lake City is mentioned in particular, coverage extends up and down the Wasatch front, including offices of both Ancestry and FamilySearch. The blue area in the map below shows where Street View is supported. The offices of both Ancestry and FamilySearch are included in Street Views. Here is a view of The Generations Network (TGN), parent company of Ancestry.com. You can see the sign out front with the company name. Zoom in to get a better view... Wait a minute. When I zoom in, the "Generations Network" logo is replaced with "Google." What does that mean? You can click the arrows going North to see the seedy side of Ancestry. Click this link to see the offices of FamilySearch and parent, the Church of Jesus Christ of Latter-day Saints. 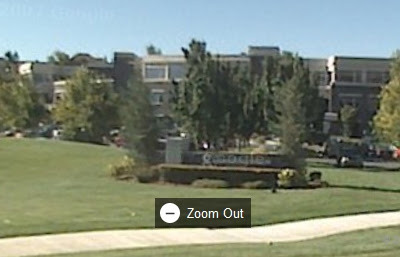 I believe FamilySearch has some offices in the Joseph Smith Memorial building (the white building on the left with the small dome—a beehive—on the left) and some offices in the Church Office Building (the tower on the right). In between you can see the Salt Lake Temple. Try moving completely around this block. See if you can find the Family History Library. It is directly West of your starting point. George Orwell got a lot of things right about the future in his novel "1984." The thing he missed, however, is that wholesale intrusions today come from [the Internet], not his fictional government-imposed "big brother." Should you come across a photo that you believe invades your privacy or is otherwise inappropriate, click the "Street View Help" link above the image and in the resulting popup window, click the "Report inappropriate image" link at the bottom. Perhaps you saw Google's specially equipped vehicles driving around taking these pictures. An alert iPhone owner snapped the shot to the right as the car approached Salt Lake back in September 2007. Click on the thumbnail to the right, as well as this gallery of Google Cars and this link. A southern view of TGN. Slightly different closeup of the TGN sign. The "seedy field" behind TGN. This view shows the Salt Lake Temple on the left and the Joseph Smith Memorial Building (JSMB) on the right. A statue of Brigham Young stands between them. Try moving a little South; the view looks like this. Or go East in front of the JSMB to see the chandeliers through the windows. The JSMB used to be the Hotel Utah, so it has a grand exterior. The Family History Library. Let me know if you are one of the people or know one of the people standing out front. An interesting juxtaposition of horse-drawn carriage and limousine in front of the Church Office Building. See how close you can get to the limousine. Mt. Timpanogos from the Squaw Peak road. You can almost spit on our offices at TGN from this spot. Further down the road you can see Mt. "Timp" on the right and Utah Lake on the left. Bridal Veil Falls, up Provo Canyon, is much prettier than this photograph can show. Entrance to Robert Redford's Sundance Resort. Drive past the couple on the road and take a look at the lady's hiking shoes. Continue up the road and look off to the left to see the buildings and parking lot of the resort with Mt. Timpanogos towering above. Google missed the gorgeous fall colors along this road by just a couple weeks. Here are some hikers googling at the odd, camera-bearing vehicle. At least they have sensible shoes. In the early '60s our station wagon bearly made it pulling our trailer to Timp Lodge for a family reunion. Grandpa wore a wig and played the fiddle. I hoped I was adopted. At the trail head to Stewart Falls, the Google driver stops to google a young hiker paying her forest service use fee. She's not really going to hike to the falls in those sandals, is she? A multi-car accident in Phoenix. Move past this fender bender to see behind the car. Paula Stuart-Warren explored the genealogical uses of Google Street View in a recent article on Ancestry's 24/7 Family History Circle. The 24 US states holding presidential primaries may not be the only thing making today super. If Mesa, Oakland and Snowflake successfully go live with New FamilySearch (NFS) today, 21 temples will be using the new program. I've made the following updates to the map, above, and to the tables at Temple Districts Using New FamilySearch. Four temples have gone live since the last map update: Los Angeles, Colonia Juárez, Guadalajara and Columbus Ohio. Denver is shown half red/half yellow. Consultants are able to register despite the lack of an e-mail announcement. The Washington, D.C. temple staff have been informed that the announcement for their district has been made, although no one in the district has received the e-mail as yet. I wonder if the e-mails were delayed so they would not be a distraction from Gordon B. Hinckley's funeral services last Saturday. I've added red dots for the Utah temples. I'm guessing that the outliers in Utah will get New FamilySearch before the heavy-volume Wasatch Front temples. I've added a red dot over the top of the Rexburg temple which will be operational after dedicatory services starting Saturday. I've added lots of international temples to the tables: Adelaide, Asuncion, Brisbane, Buenos Aires, Copenhagen, Madrid and Preston. I've added a target date of 26-Feb-2008 for Las Vegas and Redlands, CA. What are we to understand by genealogy vendors name count claims? When WorldVitalRecords.com claims "872,278,874 Names in 5,389 Databases," aren't we led to believe these are counts of people names? 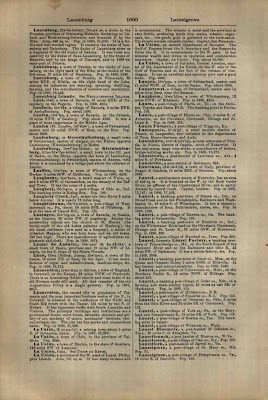 But WorldVitalRecords.com claims 337,484 names in Lippincott's Gazetteer of the World, 1895. This is a gazetteer! Yeah, yeah; many places are named after people. But the database information notes there are only 125,000 place names on 2,895 pages. The claim of 337,484 names amounts to, on average, 2.7 names per place and 117 names per page! Ancestry.com claims 2,112 in Lippincott’s Gazetteer of the World, 1913. A little experimentation shows the book has grown to 2115 pages, which means Ancestry claims about 1 name per page. I picked a page from the 1913 edition at random to examine. Page 1000 is about half-way through the book. (Click on the adjacent image to see it yourself.) I pulled it up and started looking for names. I ignored people-place names such as Baltimore, St. Louis and Clay County. The only name I found was Albus Dumbledore. Oops, Albertus Magnus. A sample of one is hardly scientific, but I find the claim of 117 names per page in a gazetteer quite incredulous. I don't think WorldVitalRecords.com is all alone. I know Ancestry has some isolated problems as well. 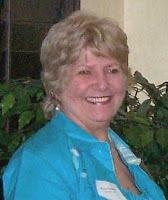 I call upon genealogy vendors to provide transparency with published name counts. Consumers have a right to know when counts are exact and when they are estimates. Vendors should disclose basic definitions and methodologies. Only transparency will provide consumers the information necessary to make intelligent purchase decisions with their limited funds in an increasingly competitive market.